Why do you need a healthy eating diet plan? There are probably a number of reasons why you are interested in a eating healthy. It may be as simple as a desire to be healthier, or as compelling as a need to lose weight or manage a debilitating illness or disease. You could be in training for an athletic event or anticipating a pregnancy, or you may just want to look and feel better. Of all the factors involved in the food you choose--foods available, your food budget, the time you have to buy, prepare and consume food, your taste preferences, your appetite, social considerations, who you live with and spend time with, your knowledge of healthy eating and nutrition, your mood (this includes hormonal shifts!) and your culture--your commitment to being healthy should be the one that colors all the rest. So, how do you go about making a healthy eating diet plan? There are several basic principles that should guide you in this process. These apply regardless of the reason you are planning a healthy eating diet, and are not listed in any particular order, since they are all important. --Your diet should supply all the nutrients, fiber and calories (energy) you need to be healthy. This means that it should have enough Protein, Fat, Carbohydrates, Vitamins, Minerals, Fiber and energy-producing calories to insure that your body has all the tools it needs to function properly. A deficiency in any one of these components will lead to health issues ranging from mild, such as irregularity due to lack of fiber, to severe, such as anemia due to inadequate iron intake. Example: A deficiency in protein may cause your body to use existing muscle mass to get the protein it needs, which can cause atrophy and weakness in the muscles you rely on to move and keep your heart beating. This is one of the reasons that excessively low-calorie or unsupervised fasting diets can be dangerous. I often tell people that my husband would eat cardboard if he thought it was good for him! That's because he is highly motivated to be healthy, and that trumps all of the other factors in choosing the foods he eats. In other words, his appetite, social milieu, taste preferences, mood, busy schedule and use of financial resources all take a back seat to his desire to be healthy, feel good and live well. He has discovered that all the parts of his life are better when he eats a healthy diet, especially as he is getting older. And it works. He often goes biking with guys much younger than him, has the stamina to work and play hard and is fit and trim, in spite of some hereditary risk factors and a few occupational pitfalls, such as a desk job with significant stress. --Your diet should include a variety of foods from all of the food groups. Although it may be tempting to plan a diet based on eating the same foods every day, by including a diverse group of foods each day, you will insure that your are getting all of the nutrients that your body needs to be healthy. Another advantage to broadening your food horizons is that you are less likely to get bored with eating healthy. Think of the panoply of fruits, vegetables, grains, legumes, lean meats, nuts, seeds and dairy products that are available to keep your diet interesting. While it’s not a bad idea, especially if you are under time constraints, to program a few healthy meals that are easy and quick, make sure that you have several that you can change up so that you are not eating the same thing day after day. Example: Put blueberries and walnuts on your oatmeal one day, and a chopped apple and pecans on it the next. Have broccoli and brown rice with your chicken breast today and switch to carrots and red potatoes tomorrow. Your diet should include a healthy balance of all of the food groups. This means that at each meal you should try to include foods from fruits/vegetables, protein (including lean meats, legumes, nuts, seeds, eggs), Grains (mostly whole grains), low-fat dairy and a judicious use of healthy fats. The largest portion should be from the vegetables/fruits group, followed by the grains group, with smaller portions of lean proteins and low-fat dairy. The USDA has recently introduced a new concept called “MyPlate” which allows you to visualize your meals in terms of the balance of food types that you have on your plate. Click on this link for more information about the USDA program. --Your diet should mostly include foods that are nutrient dense, or that have a lot of food value in relation to the calories they provide. Poor quality foods that are basically empty calories should be limited or better yet, avoided. You only have so many calories to choose from if you are going to maintain a healthy weight, so make those calories count by choose real foods that provide nutritional benefit. Another way of saying this is that you should, whenever possible, choose whole foods, such as fruits, vegetables, lean meat, nuts, seeds, whole grains, low-fat dairy and healthy fats, and skip overly-processed junk foods such as cake, cookies, doughnuts, salty snack foods, processed meats and sugary soft drinks. --Your diet should have enough calories but not too many for your age, gender and lifestyle. This means that you should plan the calories in your diet according to your age, activity level and current weight. If you are planning to lose weight, you will need to eat fewer calories, while if you need to gain weight or are very active, you will need to plan a diet with more calories available. You will find that age is a factor, because your metabolism will slow down a little bit every year, from the time you are in your twenties or thirties until the end of your life. Vegetables are rich in vitamins, minerals, fiber and phytonutrients (chemicals that occur naturally in food that help prevent disease). You should include a variety each day and be sure to eat some from the dark green leafy, such as broccoli, greens, spinach) and deep yellow/orange, such as sweet potatoes, carrots, winter squash, at least twice a week. Caveat for Healthy Eating Diet Plan: Although French Fries are strictly speaking a vegetable, the deep-frying and salt rule them out as a healthy vegetable choice. The same applies to any vegetable that has been deep-fried or candied. I would avoid these all together, since the way they are prepared pretty much negates the value of the vegetable, but at least limit your consumption of these foods. Fruits are a good source of some vitamins, potassium, fiber and phytonutrients. They should be consumed in a colorful variety, since each color provides a different phytonutrient. Choose fresh or frozen fruits whenever possible, or those canned without added sugar. Fruit juice can be counted as a fruit serving, but use it sparingly, since it is high in calories and easy to overdo on. Interesting Fact about Healthy Eating Diet Plan: There is some evidence that fruit juice, due to its high fructose content and because it lacks the fiber of the fruit from which it came, is more likely to lead to fat production in your body. This is due to the way fructose is processed by the liver. There are also those who believe that once the fruit is crushed to make juice, it begins to lose some of its health-giving qualities. Grains provide B vitamins and some minerals and fiber, and as often as possible, at least half of the time, should be eaten as whole grains. There are a variety of grains to choose from, including the obvious ones like wheat, rice, rye and oats, but you may want to try some of the less common varieties, such as quinoa, buckwheat and amaranth. Caveat for Healthy Eating Diet Plan: While it’s true that baked goods like cakes, cookies, doughnuts, etc. are made from grains, they contain loads of added sugar and fat, which makes them a less desirable choice for a healthy diet. This also applies to fried rice, presweetened cereals and muffins, although maybe to a lesser degree, depending on the individual product. In addition to protein, these foods provide B vitamins and certain minerals. Legumes, nuts and seeds also provide fiber. When choosing meat and poultry, choose the leaner versions and prepare them with as little added fat as you can and still make them palatable. Eat nuts and seeds sparingly, because of their fat content. Caveat for Healthy Eating Diet Plan: Limit or avoid processed meats, such as sausage, luncheon meats, bacon and hot dogs and grilled meats due to their potentially negative effect on your health. I also recommend that you eat grass-fed, free-range and organic meat and poultry whenever possible. Although, fish is a good choice for its healthy fats, there is some concern about harmful environmental toxins found in fish that may offset some its healthy advantages. Some health experts recommend that you eat sardines, rather than larger, carnivorous varieties, which may contain more of these toxic chemicals. Dairy products provide protein, certain vitamins and some minerals, particularly calcium. It is usually recommend that you choose low-fat or fat-free versions of these foods, to get the benefits, without the fat and extra calories. 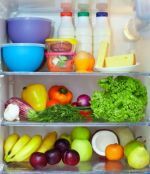 Since pesticides are mostly stored in the fat of animals, skipping the fat in dairy products, especially if you don’t buy organic, is probably a good idea. It is also a good idea to choose dairy products that do not contain added sugar whenever possible. In spite of what you may think, you need fat in your diet. Eating a diet that is too low in fat, will not only leave you unsatisfied, but may lead to health problems, since your body needs the essential fatty acids that the fat in food provides. Most of the fat in your diet should come from foods that have healthy fat in them naturally, such as avocados, nuts, seeds and fatty fish. When adding fat, choose mono-unsaturated oils such as olive oil. Avoid trans-fats that are found in processed foods in the form of “hydrogenated” oils. The rule of thumb for planning a meal is to choose a protein food and add some vegetables/fruits and whole grains, with a side of dairy. Your plate should have more room taken up by vegetables, fruits and grains with less space for protein and dairy foods. Also, if you think a food is a bad choice—lots of fat, lots of sugar, overly-processed or devoid of nutrition, it probably is. If you think it’s good for you—fresh, colorful, lightly cooked, high in fiber, in other words, real food—it most likely is. 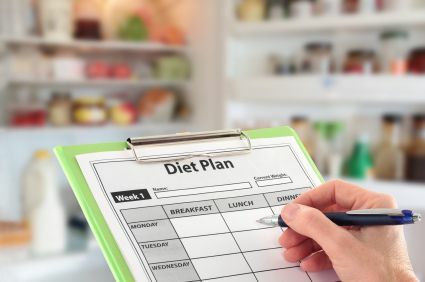 In case you need a little help making a plan, here is one that is recommended by the USDA for someone on a 2,000-calorie diet, which encompasses many adults. These amounts can be divided up into meals and snacks throughout the day. Keep in mind that if you are an active person, and need more than 2,000 calories, you can use this healthy eating plan as a basis and just add some servings across the board to each group. Conversely, if you need fewer calories because you are sedentary or trying to lose weight, you can limit the discretionary calories and be sure to choose low-fat versions of dairy products and meat. -Eat 2 cups of fruit each day. -Eat 2 1/2 cups of vegetables each day. -Eat 6 oz. of grains each day. -Eat 5 1/2 oz. of meat and legumes each day. -Eat 3 cups from the milk group each day. -Limit yourself to 6 tsp. from the oils group each day. -Eat 267 calories of discretionary (meaning you choose!) each day. Of course, there are other recommendations that would enhance this healthy eating plan, such as choosing fresh fruits and vegetables, whole grains, and good quality fats, but this is the basic structure of a healthy diet. Over time, the food choices you make will add up and help create your overall health picture. If you do it right, you will soon find yourself the picture of health! -Regardless of your age, gender, health status, income level or other factors, a healthy eating diet plan should be at the top of your lifestyle to-do list. -Your healthy eating diet plan needs to supply all the nutrients, fiber and calories (energy) you need to be healthy. -Your healthy eating diet plan should include foods from all of the food groups each day. -Variety is important when choosing the foods you include in your daily healthy eating diet plan. -More often than not, choose foods that are nutrient-dense in your healthy eating diet plan. -Your healthy eating diet plan should have sufficient calories but not too many for your gender, age and lifestyle. -Healthy fats are an important part of your healthy eating diet plan. -The rule of thumb for a meal that is part of a healthy eating diet plan is to choose a protein food and add some vegetables/fruits and whole grains, with a side of dairy. -Establishing a healthy eating diet plan, is one of the best things you can do for your health. Click here to go from Healthy Eating Diet Plan page to Best Diet Plan page. Incomplete protein is discussed with emphasis on sources and a list of proteins that complement each other. Discussion of what constitutes healthy food, based on the five nutrients and how they contribute to good health.